Indirect taxes collection by the government may fall short of the target during the current financial year due to disruption caused by the GST rollout, Central Board of Excise and Customs (CBEC) chairperson Vanaja Sarna said on Sunday. For the fiscal year ending March 2018, the government had fixed a target of Rs 9.68 lakh crore for revenue collections from customs and goods and service tax. However, the CBEC chairperson said there was no plan to revise the revenue collection target for the year. The CBEC is the apex body for the administration of indirect taxes and forms part of the revenue department of the Ministry of Finance. The revenue collection target from customs and GST, which put together is Rs 9.68 lakh crore for the current fiscal, seems difficult for the department to achieve at the moment, keeping in view the recent GST rollout, the CBEC chairperson said in Mumbai. She was talking informally to journalists on the sidelines of the half marathon organised by the customs department. Finance Minister Arun Jaitley also attended the event. However, Sarna said the government has made it clear that it has no plans to revise the target. Rather, it will wait for the GST rollout to settle down over the next five to six months. Goods & Service Tax was rolled out on July 1 Moreover, the department will not penalise traders for any default on tax payment at the moment, she said. Customs has done well but we have to wait till the GST rollout settles down, she added. In reply to a query, Sarna said close to Rs 200 crore has been disbursed by the department in the form of refunds to exporters so far. Right now, she said, the department wants to be a facilitator for the GST implementation. It is not our job to penalise traders at the moment. This is despite the fact that our intelligence officials are constantly keeping a close watch on the entire development related to goods and service tax, she added. A survey by the revenue department has detected multiple reasons for the glaring gap between the number of eligible taxpayers on the Goods and Services Tax Network (GSTN) and the tax returns being filed in each month. Apart from lack of internet connectivity with some of the taxpayers and GSTN’s technical glitches, lack of funds for paying taxes and a notion that no returns are needed to be filed in case of nil supplies caused returns trailing the eligible taxpayer base, Mahender Singh, member (GST), Central Board of Excise and Customs, told FE. The problems encountered differed depending on the taxpayers’ profiles, he said, adding that the department would continue its outreach programme, including hand-holding of small taxpayers to ensure more returns are filed. Even after several weeks have passed after the deadline for filing the interim return GSTR-3B for July, at least 10 lakh of the 65 lakh eligible taxpayers haven’t filed it so far. Similar gaps existed in the subsequent two months as well. Some assessees haven’t filed returns as they are below the GST threshold (Rs 20 lakh annual turnover) but have migrated to GSTN from the earlier VAT regime, which had a lower threshold. A section of these assesses is awaiting de-registration from the portal. Assessees dealing in exempt supplies have also chosen not to file returns. “We didn’t find any common theme (for the slow filing of returns)… Instead, there are myriad reasons for the same. However, these issues can be resolved by continuing our outreach programme effectively,” Singh said.The government had waived late fee for filing returns for July. It extended the waiver to August and September also on Tuesday. Although, nearly 95% of GST revenue comes from less than 5% taxpayers, the government needs data from all eligible taxpayers to analyse the impact of GST more efficiently and accurately. However, with many taxpayers not filing returns, the vital GST feature which matches sales and purchases of businesses to check tax avoidance could be difficult to implement. Revenue secretary Hasmukh Adhia had told FE earlier that the department could look at non-coercive ways to improve compliance. The revenue department is keenly watching the first cycle (July) of filing comprehensive returns (GSTR-1, GSTR-2 and GSTR-3) which ends on November 10. The uncertainty over tax filings has prevented the GST Council from announcing dates for filing the detailed returns for subsequent months. “We will make a decision on dates for later months after the experience from July results,” Singh said. Even among businesses that filed the interim returns, a large segment (40% in July) paid no tax in cash. Although the government is reconciled to this given that in the initial two months after GST roll-out the accumulated transitional credit was high and was to be legitimately used. It is another matter that the credit would be allowed in a staggered manner (up to December) to avoid a temporary revenue shortfall. Also, there are players who deal with exempted (zero tax) goods and items outside the GST ambit. Still, the government feels that the gap between the eligible taxpayers and GSTR 3 B filings is still large. Tracking the GST that you pay is now at your fingertips! A mobile app to help consumers verify the rate of GST levied on the product they purchase, or the service they access, and to assist the tax authorities in the crackdown on enterprises retaining the tax they collect, is to be launched soon by the Telangana government. The Commercial Taxes Department and IIT-Hyderabad have developed the TGST app and its beta version is available, Principal Secretary-Commercial Tax and Excise Somesh Kumar said here on Thursday. It would bring in more transparency and act like a feedback mechanism. The app would also provide information on whether the enterprise had opted for the composition scheme under GST, he said. Firms that have opted for the scheme are not supposed to levy tax, including a hotel, Mr. Kumar said in an interaction with presspersons on the sidelines of the conference on ‘GST – Post Implementation Issues’. Earlier, addressing the conference organised by industry body Assocham, the senior official said it has been 100 days since the roll-out of goods & service tax and revenue income was improving. The GST Council, he added, was addressing issues concerning the exporters as well as small and medium enterprises. In two months, Rs 2,800 crore had been collected in the State, he said. Additional Commissioner-GST (Rangareddy) Manjula D. Hosmani said at the conference that the government was aware and reacting proactively to the concerns related to GST. As of October 5, of the 2.21 lakh registered assessees under Goods & Service Tax, around 1.37 lakh had filed their GSTR-3B, she said, advising them to avoid last minute rush in filing returns. Former Chairman of CBEC S. Dutt Majumder said GST is a work in progress and the glitches were being addressed. Total registrants under GST is 85 lakh, which includes about 23.18 lakh new taxpayers and 62.25 lakh taxpayers who have migrated from the VAT, excise and service tax regime. With the deadline for filing Goods and Services Tax (GST) returns for August coming to an end in less than 72 hours, only 6.9 lakh taxpayers have filed their GSTR-3B- a short summary return, at the end of Monday, said sources familiar with the development. The government expects tax returns from about 64 lakh tax payers for the month of August. According to the data accessed by The Indian Express, about 4.99 lakh tax payers had filed 3B returns for August till September 17. The deadline for filing GSTR-3B will end on September 20. GSTR-3B is a single page summary return form that is to be filled by all normal registered tax payers on self assessment basis. In the GSTR-3B, assessees need to furnish summary of information about sale and purchase, available input tax credit (ITC), tax payable and tax paid. The 3B tax return does not have to be filed by Input Service Distributor (ISD), a Non-Resident Person, Tax Collector at Source (TCS), Tax Deductor at Source (TDS) & Composition Dealers. On Saturday, Sushil Kumar Modi, Deputy Chief Minister of Bihar, who is heading the newly-formed Group of Ministers to look into the glitches of the GST Network said that while 46 lakh taxpayers had filed their 3B returns for the month of July, for August, only 3.05 lakh GSTR-3B returns had been filed till Saturday. The total number of registrants under GST is 85 lakh, which includes about 23.18 lakh new taxpayers and 62.25 lakh taxpayers who have migrated from the earlier VAT, excise and service tax regime. About 11 lakh dealers have registered under the composition scheme, Modi had said. “Already decided that first cycle of GSTR 1,2,3 will be given a long rope…time for GSTR 1 is October 10, GSTR 2 will be October 31 and GSTR 3 will be November 10…In the meantime we have extended the time for GSTR-3B for six months. So, for 6 months people have to file their self-assessed summary return by 20th of the next month and there is not going to be any extension of time as far as 3B is concerned,” Revenue Secretary Hasmukh Adhia had said. According to experts, the GSTN portal will get tested once again with the taxpayer rushing to file their August returns in the next last two days. In August, due to huge rush of July GSTR-3B return filing on the penultimate date, the GSTN software witnessed glitches and the last date of filing was extended. “If 90 per cent of the assessees are going to attempt filing returns in the last two days of the deadline then it is definitely going to test the system. To that extent it will test the GSTN portal. Having said so , we can’t really blame the tax payers because most of them very busy in getting GSTR-1 done. I think it’s only in the last three or four days they have started working on GSTR- 3B,” said Uday Pimprikar , Tax Partner at EY India. An email sent to Adhia seeking comment on the 3B filings by taxpayers for August, did not elicit any response. Sources said the issue pertaining to the unexpectedly high transitional input tax credit claims of Rs 65,000 crore by businesses has not been resolved because of the non-availability of data from GSTN. CBEC has written to chief commissioners directing them to verify every input tax credit claim of over Rs 1 crore. The verification by the tax department may include matching credit claimed with closing balance in returns filed under earlier laws and checking eligibility of credit under the GST regime. The report is expected on September 20. Several Indian companies, including some large entities, may start receiving notices from Monday on transitional tax credits in the run-up to the introduction of the single producer levy, two people with direct knowledge of the developments told ET. The notices from the indirect-tax department follow last week’s direction from the Central Board of Excise and Customs (CBEC) that asked chief commissioners to verify all transitional credit claims beyond Rs 1 crore. About 160 companies, which collectively have claimed about Rs 65,000 crore in transitional tax credits, would be issued notices in the coming weeks. “By Friday, chief commissioners had received the names of companies in their jurisdictions and asked for a basic report on the subject. Notices would be issued to companies and explanations would be sought for the amounts claimed in transitional credits,” said a person in the know. In some cases, the indirect-tax department is also asking companies – particularly some Hyderabad-based infrastructure establishments — to produce the VAT returns of the past one year. The government is seeking these details to cross-check the transitional credit in GST. Transitional credits are basically tax credits accumulated before July 1 on pre-GST stock. According to the GST law, the credit can be set off against GST liability. Taxmen suspect that some companies are misusing the provision and have filed fake returns. “The suspicion is that many companies have claimed credit when they do not have proper invoices to support them. Ideally, when this happens, companies could only claim 60% of transitional credit, but some companies seem to have taken 100% credits,” said a tax officer. Industry trackers say that this step by the government has spooked several companies. Individual companies under the lens could not be ascertained, but the tax officer quoted above said: “Most of these companies being scrutinised are major vendors of some of the biggest Indian companies. In most cases, the companies still have time to rectify their mistakes,” he said. Some industry trackers say that Rs 65,000 crore as transitional credit in the total GST revenue of Rs 95,000 crore for July appears disproportionate. “The amount of opening credit does look to be on the higher side, particularly because many companies have not yet filed the TRAN 1. In some cases, companies may have made genuine errors in credits. Many of these companies may revise in the coming weeks,” said Pratik Jain, Partner, National Leader – Indirect Tax – PwC India. Experts said those scrutinising credits now time may be doing so prematurely as several companies are yet to file GST due to the extended deadline. “The deadline for filing Trans 1form is extended to October 3 and so the department will get final data only then,” said Sachin Menon, national head of indirect tax at KPMG. GST Council holds out-of-turn meeting via video conferencing; raises cess on cigarettes. 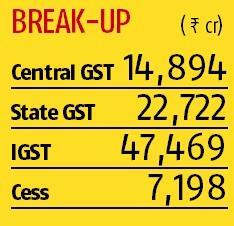 Earlier, cigarettes were taxed at the peak rate of 28%, along with a cess of 5%. This was lower than what was levied in the pre-GST era. The additional tax will give Rs 5,000 crore extra revenue to the exchequer that will be used to compensate the states. The Central Board of Excise and Customs (CBEC) clarifies integrated GST (IGST) will be levied only when goods are cleared by the Customs, in case of high-sea transactions; this clears ambiguity whether tax being levied for each leg of a transaction. The Council cuts rate on job works for the textile sector to 5% from 18%, approves e-way bill without revising a threshold of Rs 50,000 and allows setting up of screening panels under the anti-profiteering measure. Rates on inputs specific to tractors cut to 18% from 28%, on government works contract cut to 12% from 18%. Rates on other services — including rent-a-car, job work in newspaper printing, entry to planetariums — reduced. Council recommends the Centre come out with an amendment in the compensation Bill to increase the ceiling on cess on luxury cars from 15% to 25%. Cabinet clears ordinance to increase ceiling on cess on luxury cars, SUVs up to 25% from 15%. CBEC notifies e-way bill; exempts items of mass consumption such as vegetables, fruits, foodgrain, meat, bread, curd, books, jewellery, judicial and non-judicial stamp papers, newspapers, khadi, raw silk, Indian flag, cheques, municipal waste, liquefied petroleum gas for cooking, kerosene, heating aids and currency. Over 36 lakh businesses have so far filed their first tax returns under the Goods and Services Tax (GST) regime, a top tax official said on Monday. Tax collected in the maiden filings under the GST regime, which kicked in from 1 July, are still being compiled as the last date for filings under different rules is not yet over, he said. The revenue department had estimated collection of around Rs 65,000 crore from maiden Goods and Services Tax, the official said. The deadline for filing first monthly return and payment of taxes under GST – the new indirect tax regime that unifies over a dozen state and central taxes, including excise duty, service tax and VAT – ended on 25 August. However, businesses that availed transitional credit were allowed to file returns till 28 August after paying taxes on self-assessment basis by 25 August. “At the start of the day today, over 36.32 lakh returns had been filed. Final tax collection numbers would be known once all the returns are in,” the official said. Under GST, businesses are supposed to file monthly sales returns and pay due taxes online. Since this was the maiden return after GST was rolled out on 1 July, the government gave companies extra time to file returns and pay taxes. Central Board of Excise and Customs (CBEC) Chairperson Vanaja Sarna, in her weekly letter to tax officials, had said the last date for payment of GST for July 2017 was extended up to 25 August. But for those taxpayers who want to fill TRAN-I this month, the last date for filing GSTR-3B is 28 August, she had said. GST Network, the company managing the tax filing apparatus, had uploaded form TRAN-1 last week on its portal for businesses to claim credit on taxes paid prior to GST rollout on 1 July. Another official said businesses can continue to file returns and pay taxes even after the deadline ends, much like what happens in case of income tax returns and payment. As per the Goods and Services Tax law, any registered person who fails to furnish details of outward or inward supplies or returns required by the due date will have to pay a late fee of Rs 100 for every day during which such failure continues subject to a maximum Rs 5,000. Besides, every person who fails to pay the tax within the period prescribed will be required to pay interest at 18 percent from the day succeeding the day on which such tax was due to be paid. Besides, of the 15 lakh fresh registrations, as many as 10 lakh are expected to file returns for July. Know all about GSTR-3B Filing And How to Enrol For GST. Deadline is fast approaching! Grab this wonderful opportunity to file your GSTR 3B return for free and become GST compliant instantly. Have you migrated to GST or Goods and Services Tax yet? As the deadline of August 20 approaches, businesses have few days left to file Form GSTR-3B. As per dates notified by the government, details relating to outward supplies for the month of July will have to be filed in Form GSTR-1 between September 1 and September 5. However, in the interim period, businesses have to file Form GSTR-3B, which will be a summary of self-assessed tax liabilities with consolidated details of outward supplies and input tax credit (ITC). But how to fill the GST enrollment application and why is it important to do so? Filing of enrollment application is necessary to avail various benefits under GST, the CBEC or Central Board of Excise and Customs has said. 1. Visit the gst.gov.in website. 2. Login with your user ID and password created by you and complete the information related to your business details, promotor/partner, principal and additional place of business, authorized signatory, up to five major goods or services or both supplied and bank account details. 3. Complete and verify the information given in the verification tab and submit the application with Digital Signature Certificate (DSC) or Electronic Verification Code (EVC). 4. You will get an Application Reference Number (ARN) (also through email) on successful submission of the enrolment application. Existing payers of levies such as central excise, service tax, state sales tax or VAT, entry tax and luxury tax are required to take up GST enrollment. All taxpayers registered under existing laws – the laws related to various erstwhile taxes that have been subsumed under GST from July 1, 2017 – are required to migrate to GST by filing the enrollment form. “Those taxpayers who have not completed the enrollment procedure on the Common Portal, are required to complete it immediately, otherwise various benefits under the GST regime will not be available to them,” the CBEC added. GST Network chairman Navin Kumar had earlier urged companies to not leave filing of their first returns under GST to the eleventh hour. Millions of companies are still not ready to file their first returns under the new Goods and Services Tax (GST) ahead of an August 20 deadline, the top official had told news agency Reuters. To help you explore the power of XaTTaX, particularly the ease, comfort, and accuracy that you can derive by filing the crucial GSTR-3B Form within the dotted line, we are offering FREE access to this FORM. So, what are you waiting for? The GST Council at its meeting next month is likely to take up taxation issues raised by sectoral bodies along with a review of the implementation of the new tax regime, a top official said. “Different issues will be coming to the table (at the next Council meeting). Things that have been brought to our notice may be on the rules and the implementation. Maybe, even on rates,” Sarna told reporters on the sidelines of a Ficci event here. Asked if concerns raised by the textile sector will be taken up, she said “possibly”. “Whatever issues have been raised… will be taken up (by the Council). When you roll out something as mammoth as GST, I would say you will always find problems or issues probably coming in till six months or a year,” Sarna said. Asked about revenues from Customs post July 1, she said revenue has been “good and buoyant”.